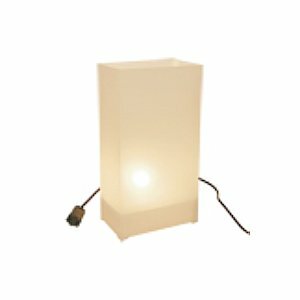 Decorate year round indoor or outdoors with this "easy-to-set up" WHITE Electric Luminaries Kit. Luminaries are a decorating tradition, and now are available in an electrified version for your party decor. Line your driveway, walkway, window sill, patio, deck, sidewalk, trees, mantel and staircase with beautiful luminaries for a perfect finishing touch for your party or special event. These electric luminiaries give off a lovely glow that will set a festive tone for your party, and make your guests feel welcome. If you have any questions about this product by LB Inc., contact us by completing and submitting the form below. If you are looking for a specif part number, please include it with your message.